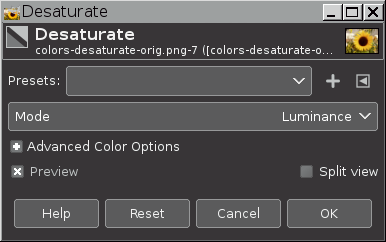 By using the Desaturate command, you can convert all of the colors on the active layer to corresponding shades of gray. This differs from converting the image to grayscale in two respects. First, it only operates on the active layer and second, the colors on the layer are still RGB values with three components, with R=G=B, which makes gray. This means that you then can paint on the layer, or individual parts of it, using non-gray colors. This command only works on layers of RGB images. If the image is in Grayscale or Indexed mode, it can do nothing. The conversion method you choose. The RGB color space in which the conversion is done. How saturated the colors in the original image happen to be, with more saturated starting colors (such as the red globe and the bright yellow sunflower) producing greater amounts of deviation from a straight Luminance conversion. The hues (for example yellows vs reds) of the various saturated colors in an image also make a difference. Being the maximum of the RGB channel values for each pixel, an HSV Value conversion to black and white is always lighter than the original color image, and also lighter than all the other ways to convert to black and white. For the red globe Lightness (HSL) produces a result very similar to Luminance, and Luma produces a conversion that is much darker. For the sunflower, Luma produces a result very similar to Luminance, and Lightness (HSL) produces a conversion that is much darker. Notice that the less saturated parts of each image look more or less the same, regardless of which method is chosen for converting from color to black and white. "Luminance" is the only physically meaningful way to convert a color image to black and white, as the resulting black and white image has the same relative luminance (reflects the same percentage of light from the various shades of gray) as the colors in the original color image. Luminance must be calculated using linearized RGB values. For convenience we say "Luminance", but what we really mean is "Relative Luminance". For more information, see Relative Luminance and CIE 1931 [XYZ] color space. GIMP 2.10 uses hard-coded sRGB values to do Luminance conversions to black and white. "Future GIMP" will support correct conversions for images in other color spaces. "Luma" is what you get if you use the formula for Luminance on RGB values that haven't been properly linearized. Luma corresponds to GIMP 2.8's "Luminosity" method of converting to black and white. Compared to GIMP 2.8, GIMP 2.10's "Luma" option uses slightly different multipliers. Unlike the GIMP 2.8 multipliers, the GIMP 2.10 multipliers have been properly Bradford-adapted from D65 to D50, which is required for use in an ICC profile color-managed editing application (at least until the next version of the ICC specs is released and people figure out how to deal with the new freedom to use non-D50 reference white points). GIMP 2.10 uses hard-coded sRGB values to do Luma conversions to black and white. "Future GIMP" will support correct conversions for images in other color spaces. The "Lightness (HSL)", "Average (HSI Intensity)", and "Value (HSV)" ways to to convert a color image to black and white use color space models that were invented for fast processing on consumer-grade computers from the 1990s. For details see HSL and HSV, paying particular attention to the section on Disadvantages. In the XYZ color space, Y is Luminance. So if you convert a color RGB image to XYZ, the "Y" of XYZ is the same number as the R=G=B values that you get when you calculate RGB Luminance. LAB is a perceptually uniform transform of XYZ. If you convert from RGB to XYZ and then to LAB, and set A=B=0.0 (or 0.5 for image editors that put the midpoint of the A and B axes as 0.5 instead of at 0.0), and then convert back to XYZ, the X and Z values will change, but Y will not change. Tutorials that produce anything other than Relative Luminance when converting an RGB image to black and white using LAB Lightness, very sadly are trading on various mathematical mistakes in the conversion routines.